The good news is for many “DIY” at home hockey applications a much less expensive material will do the trick. HDPE “puckboard” is literally named after the hockey puck – it is a type of plastic sheet used as hockey “boards”. That’s a purpose it can serve in your basement or home rink as well: puck board will take the power of hockey shots and not break. Most commonly it’s used as a platform to shoot pucks off of: protecting the ground and providing a smooth surface to shoot off of. The plastic can be had for pretty cheap from a distributor that stocks it. You can expect to pay between $80-$120 for a 4′ x 8′ sheet, which is quite inexpensive as far as traditional “industrial” plastics go. The plastic is easily worked with home tools (drills, power saws). You do need to watch out for the fact that it is not UV-stable meaning if you leave it outside you will eventually get UV damage…It will crack and become brittle, no longer holding up to shots. 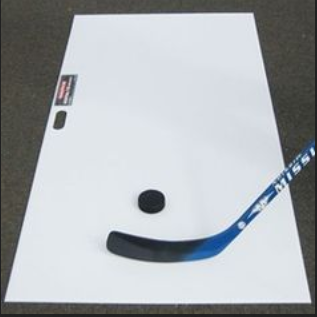 That said, if you’re a hockey fan and want a cost-effective plastic to use for anything short of skating on, puck board will serve you well.